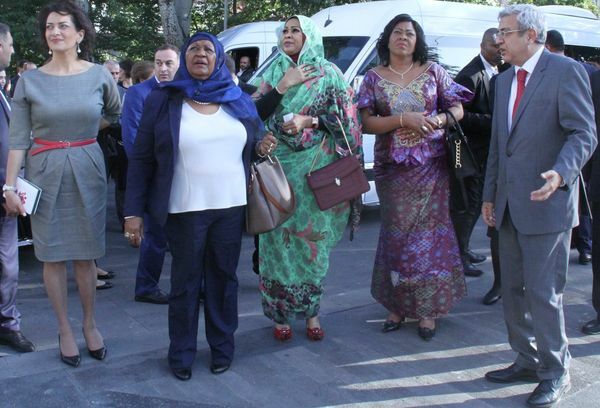 On October 11, the wives of the heads of states participating in the 17th summit of La Francophonie visited the Mashtots Matenadaran accompanied by RA Prime Minister's spouse Anna Hakobyan. Accompanied by the Director of the Matenadaran Vahan Ter-Ghevondyan, the delegation toured the museum complex of the Matenadaran and got acquainted with the exhibition "Armenia-France: centuries-old ties." On the occasion of the 17th summit of the International Organization of La Francophonie in Yerevan on October 11 at 16:30, 2018, held the exhibition "Armenia-France: centuries-old ties" in the Mashtots Matenadaran. The exhibition is organized by French-Armenian historian armenologist Armen Claude Moutafian. The exhibition presents manuscripts, antique books from Matenadaran’s funds, as well as archival documents, maps and photographs from Armen Claude Moutafian’s personal collection, that reflect the Armenian-French historical-cultural relations dating back centuries.